Dr. Hussein Alawi, on his way to give free medical care to families that can't make it to hospitals in Yemen. Intensive fighting and bombing has cut off access to health care for many people across the country. 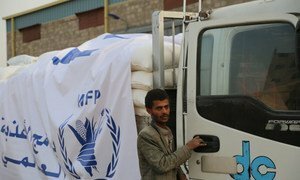 As the conflict in Yemen this week enters its second year, the United Nations health agency is calling for additional funding and access to the more than 80 per cent of the population in urgent need of humanitarian aid. “Despite our efforts so far, much more needs to be done to respond to the health needs of people in Yemen,” said Dr. Ala Alwan, World Health Organization's (WHO) Regional Director for the Eastern Mediterranean. He voiced concern about the limited funding for the health sector, which so far only received six per cent of its 2016 requirements. The health situation in Yemen had been challenging before the current conflict, but further deteriorated under the ongoing violence which has forced one-quarter of all health facilities to shut down due to damages or shortages of staff, medicine or other resources. Some 19 million people lack access to clean water and sanitation, placing them at risk of infectious diseases such as dengue fever, malaria and cholera, WHO cautioned. In addition, more than 14 million Yemenis are in need of urgent health services, including more than 2 million acutely malnourished children and pregnant or lactating women requiring treatment. Calling the health needs in Yemen “vast,” Dr. Alwan highlighted some of the positive ways in which the UN agency and partners have been able to reach people in need. “We sent life-saving medicines and supplies via boat when roads were blocked, and we transported safe water to health facilities by animals due to lack of fuel,” he said, noting that 450 tonnes of life-saving medicines and supplies were delivered, along with one million liters of fuel to hospitals and 20 million liters of water to health facilities and camps hosting internally displaced persons. The UN agency and partners were also able to provide mental health services through mobile medical teams and mobile clinics. They also vaccinate some five million children under the age of five against polio and 2.4 million children under the age of 15 against measles and rubella.